Cincinnati, Ohio, January 5, 2011, Denise Amiot, Assistant Principal for the West Clermont Local School District and Adjunct Professor at Xavier University, has been recognized by Elite American Educators for dedication, achievements, and leadership in special education. For the last 30 years, Ms. Amiot has lived the life of an educator: even outside of the classroom, she feels the need to constantly share her knowledge and ideas with others. Establishing her career with the Board of Mental Retardation and Developmental Disabilities, she refined an expertise in special education and was afforded many opportunities that led to her current role as assistant principal for the West Clermont Local School District. On a daily basis, Ms. Amiot oversees the operations of the school, and meets with teachers and students to address and solve problems. Likewise, she collaborates with other administrators to think of ways to constantly progress the quality of education. In addition, Ms. Amiot serves as an adjunct professor at Xavier University, where she bears the responsibilities of mentoring students who are pursuing licensure in administration, and teaching courses on special education and human development. An affiliate of the Council for Exceptional Children, Ms. Amiot retains a Bachelor of Science in education from Edgecliff College and a Master of Education from the University of Cincinnati.She also holds a second master’s degree in educational administration, which she earned in 2005. In the coming five years, Ms. Amiot intends to pursue a doctoral degree to continue learning and bequeathing her knowledge onto others. 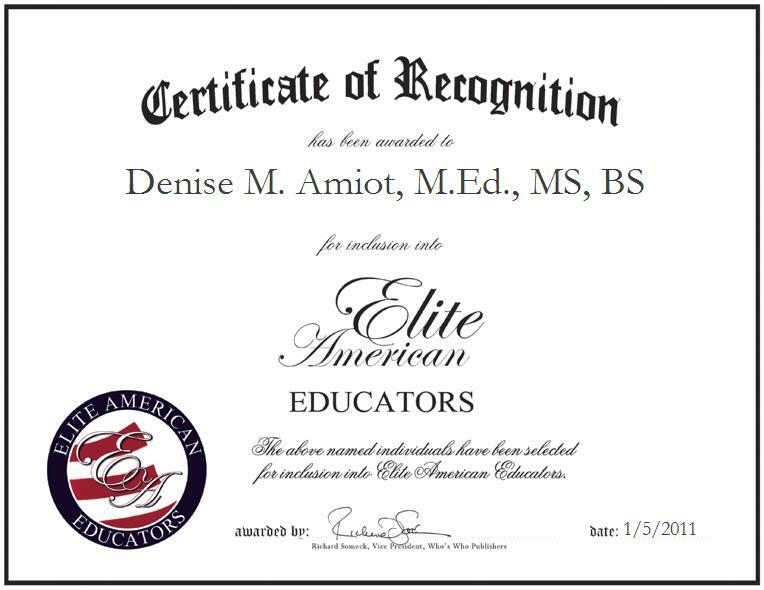 Denise M. Amiot, M.Ed., MS, BS was originally selected for inclusion in Elite American Educators in May, 2011. We are proud to be featuring Ms. Amiot again in Elite American Educators for 2011/2012.